Samsung, once an also-ran brand, has been the hot consumer-electronics brand the past few years, thanks to its steady stream of beautifully designed plasma TVs, cell phones, DVD players, and other gear. Now it’s finally entering the photo printer market, and Samsung’s competitors definitely have cause for worry. 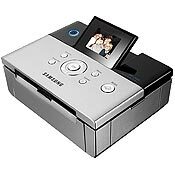 The new Samsung SPP-2040 is one of the few affordable dye-sublimation photo printers on the market, a formerly high-end technology that uses heat to transfer dye to photo paper (as opposed to inkjet printers, which spit out dots of ink). The result is generally warmer, truer colors, and more fade-resistant prints. This unit reads all manner of memory cards, works with PictBridge-compatible cameras, and has the usual zoom and crop controls as well as some nice extras (black-and-white, sepia, antique, etc.). Prints work out to a reasonable 40 to 60 cents each. And it works right out of the box, so you don’t need to be connected to a computer to use it (although it’s PC and Mac compatible).